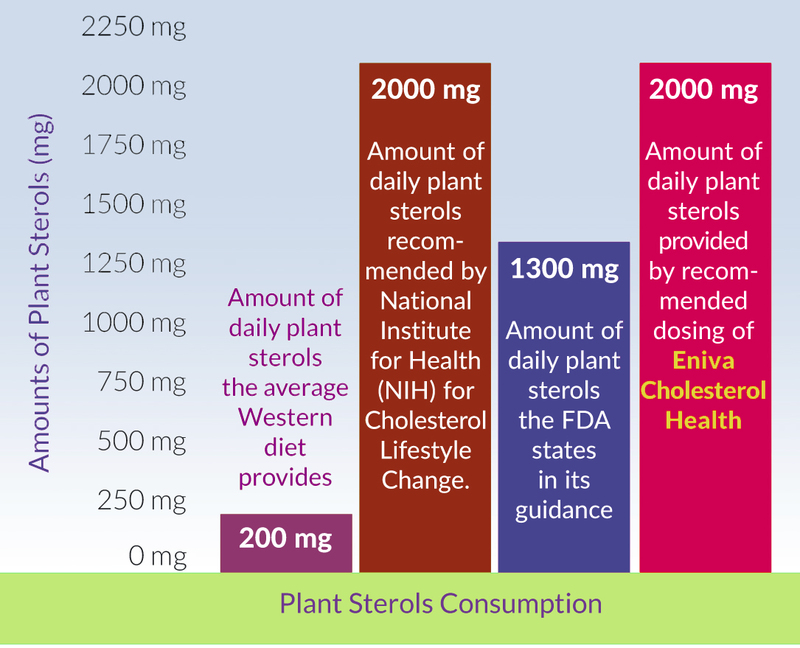 According to the FDA, "products containing at least 0.65g per serving of plant sterol esters, taken twice daily with meals for a daily total intake of at least 1.3 g, as part of a diet low in saturated fat and cholesterol, may reduce the risk of heart disease." Scientific References: Data on file, Eniva Corporation, 2018. **Products containing at least 0.65g per serving of plant sterol esters, taken twice daily with meals for a daily total intake of at least 1.3g, as part of a diet low in saturated fat and cholesterol, may reduce the risk of heart disease. 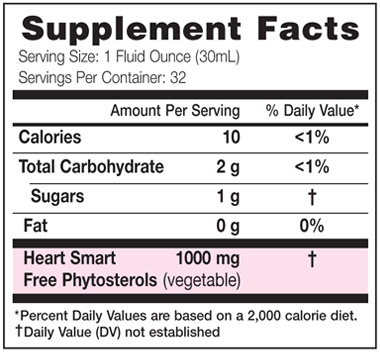 The recommended dose of 2 ounces of Eniva Cholesterol Health provides 2g of plant sterol esters for maximum cardiovascular benefits. NOTE: Each person may experience different outcomes depending on their individual health status. Individual results may vary. Proper weight management should be accomplished in conjunction with a good diet and exercise. Eniva supplements are meant to assist the body's efforts in weight management and do not guarantee weight loss. Consult your healthcare provider before starting a supplementation program. Other Ingredients: Purified water, Corowise™ plant phytosterols (contains corn), sugar (beet), natural flavors, guar gum, sorbic and/or benzoic acid(s) [protect freshness], malic acid, citric acid, stevia leaf extract. Directions: Consume 1 ounce, 5 minutes prior to meals. Minimum 1 oz. daily (1/2 oz. am and 1/2 oz. pm). For best results: Consume 2 total ounces daily: 1oz with lunch and 1oz with dinner. Recommendations: May combine with 8 ounces of water or juice. Due to Cholesterol Health’s fat limiting properties, wait 60 minutes after consumption before taking any other supplements containing fat soluble nutrients (VIBE,® EFACOR,® CoQ10+ and Eye Health+®). Drug Interactions: This product is safe to use in conjunction with statin medications. Always seek your healthcare professional’s advice. Caution: Do not consume if tamper resistant seal is broken or missing. Do not consume if allergic to components found within product. As with all dietary supplements, contact your doctor before use. If taking prescription medications, have an ongoing medical condition, are pregnant, nursing or under age 18, consult doctor before use. KEEP CAP TIGHTLY CLOSED. KEEP PRODUCT OUT OF REACH OF CHILDREN.